NPR recently aired a story about a study from AAA that claimed that premium (high octane) gasoline is unnecessary for most drivers. AAA concluded that high octane gasoline had no effect on gas mileage and that purchasing premium gasoline for a car which did not require it was a waste of money. I came to the opposite conclusion with my 2009 Mazda6. Between 2012 and 2014 I conducted my own study and reached the opposite conclusion: My study found that for my specific car and modestly high gas prices ($2.00 and higher) there is often a price advantage in purchasing premium gasoline. I tested the mileage performance of my 2009 Mazda Mazda6 using several grades of gasoline. The owner's manual recommends regular gasoline. I conducted the tests by tracking my mileage and the amount of fuel added at each refueling. My driving consisted primarily of commuting to and from work and I did not change driving patterns dramatically. I observed a 9% improvement in fuel economy when using 89 octane gasoline over 87 octane and 12% improvement using 93 octane over 89 octane. Depending on the base cost of gasoline, opting for a premium gasoline may make financial sense. The cost difference between levels of gasoline is typically 10 to 15 cents. When the base cost of gasoline is higher than $2.00, a 10 cent increase in the price per gallon is only about 3.3% cost increase. 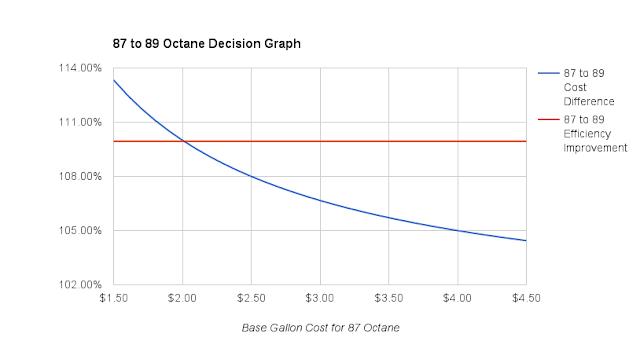 However, when the cost of gasoline is low or the price difference between octane ratings is high, the gains in fuel economy don't justify the increased cost. Assuming a 9% improvement in economy and a 20 cent price difference between 87 and 89 octane gasoline, a base cost of $2.00 or higher per gallon justifies an upgrade to 89 octane. Engines with computer controlled fuel injection are able to precisely vary the amount of fuel used with each cycle of the engine. The octane rating of a given gasoline does not reflect the amount of energy it contains. However, the computer controlled fuel injection in newer cars is likely a factor. Higher octane gasoline is less prone to knocking (exploding at the wrong time). My best guess is that with lower octane gasoline the engine's computer is detecting knocking and is adjusting the engine's performance to compensate. With higher octane gas, the computer detects less knocking and is able to run the engine at a higher level of efficiency. With older style engines (such as carburetor fed engines) the engine cannot be adjusted while running in the same fashion, thus there is no benefit from changing octane levels. Check out Goodnight Server Room! I am a software engineer. I'm also a father who loves reading to his kids. They have piles and piles of books about trucks, animals, and trains - lots of fun and interesting topics and stories about hard working people, but nothing about what their dad does all day. I searched for kids books about my computers and came up empty handed, so I wrote this book. Goodnight Server Room is a lighthearted exploration of computer terms, written to be pleasant to read the hundredth time as it is the first time.